How Rude! 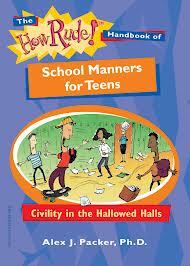 Handbook: School Manners by Alex Parker. What counts as rude behavior in school? What can you do when a teacher is rude? When someone tries to copy off of your paper during tests, should you rat or not? How can you dress for school success? What’s the best way to handle bullies, bigots, bashers, and harassers? School can be cruel. Here’s sound advice (touched with humor) for teens who want to make it more bearable. Pp. 116. This entry was posted in Adolescent/Transition Issues, Our Library and tagged Education, self-advocacy, social skill. Bookmark the permalink.